This past month has been an incredible experience for me! I was able to live in the country where my grandparents were born and raised and experience the language, culture, and history. Although it was extremely difficult to leave my husband and children for an entire month, this opportunity has not only allowed me to evolve into a more appreciative person but also grow as an educator. The differences in the culture have made me step back and look at my life and realize that I am very fortunate to have the things that I do. As a future educator I am taking with me the understanding of how non-English speaking students feel when they enter our classrooms. When these students come into our classrooms they feel nervous, scared and stressed because of the language barrier that they are struggling with. Being in a learning environment for three and a half weeks where the main language of learning is German and not being able to comprehend what they were saying was a very stressful and an enlightening experience because it has allowed me to think of ways to better suit the needs of my future students. As an educator, it is my responsibility to teach these students and make them feel comfortable in their learning environment. I will be forever grateful for this experience and the memories that I take back with me. I really do not know how I can sum up what this entire month has meant to me. The first day we arrived here was such a shock to me. I had never flown before, had no idea what public transportation consisted of, and was crying like a toddler! I know everyone around me thought I was out of it and would be catching the first flight back to South Carolina. Here I am though, a month later, and I made it! I have grown so much as an individual, and as an educator. I have experienced what it is like to be in a completely new culture, and surrounded by a language that I know little to none of. I have sat in the classrooms here and known nothing that was being said. I feel as an educator I can understand students from a different culture in a completely new way. I do not feel that we can ever understand what they fully feel, but I am sure I have experienced some of the same thoughts: fear, stress, and doubtfulness. I can see a totally different way to approach students of a different culture, because I have sat in an environment and felt out of place. This trip made me realize that as much as you believe your way is not the only way, you can never fully understand that till you are in a culture where your way is NOT the way. I am forever grateful for the knowledge, experiences, and memories that I will carry back to the states with me. This was an eye-opening experience for me. I can’t believe that this month has flown by. I have enjoyed the time I spent here and it will impact me for the rest of my life. The biggest part of this experience for me was the culture shock. I had no idea what to expect when we arrived and the people were so welcoming. The public transportation was another new thing for me. We traveled on a plane, train, bus, and taxi our first day! This was so stressful but by the end of the trip it did not faze me at all. The students here are so nice, they had a limited knowledge of English but they tried so hard and were so excited to be around us. I loved being in the schools and seeing all of the different courses they offered their students. I was surprised to see that the students have a woodshop class; this is so different from everything we have at home. I now feel much better prepared to handle students who come into my class from other cultures. I feel that I can know relate to students who do not know the language or the customs. This experience has allowed me to see how it feels to be in their position and given me a much needed perspective as an educator. I am so glad I had the opportunity to take this trip and am forever grateful for the time I have spent here. I cannot believe I have spent the last month in Germany. The time flew by and I have experienced several emotions while on this trip. I have felt everything from apprehension to wonder both inside and outside the classroom experience. I see this journey occurring from two perspectives: cultural and professional development. While in Germany, I have learned of the varying differences between our two cultures some good and some that are just different. I have traveled to several places and explored the history of the country, which is unlike anything back home. Some would argue that the study abroad program was a glorified vacation and not a professional development experience. I would say that is incorrect, while we did take advantage of exploring the region on the weekends. During the rest of the week, we got up early and walked to school where we sat in a classroom that barely spoke English. I gained a new appreciation for my students who come from another country, while only knowing a little bit of English without breaking down. That is what I experienced my first few days at the school. I was exhausted while at school because I spent most of my energy throughout the day trying to pick up any words that I recognized, between taking a six week conversational German class, and listening for any words that had similar definitions in English. I know how it feels to look at a text and be able to “read” the language but not comprehend any of the information presented. I was eager to learn and wanted to participate in the classroom but due to the language barrier, I could only do so much. I thrived in math because it dealt with numbers, and in the related arts because of the visuals and following the other students (mimicking). These characteristics are the same traits that I see in my students who are ESOL or have a learning disability. 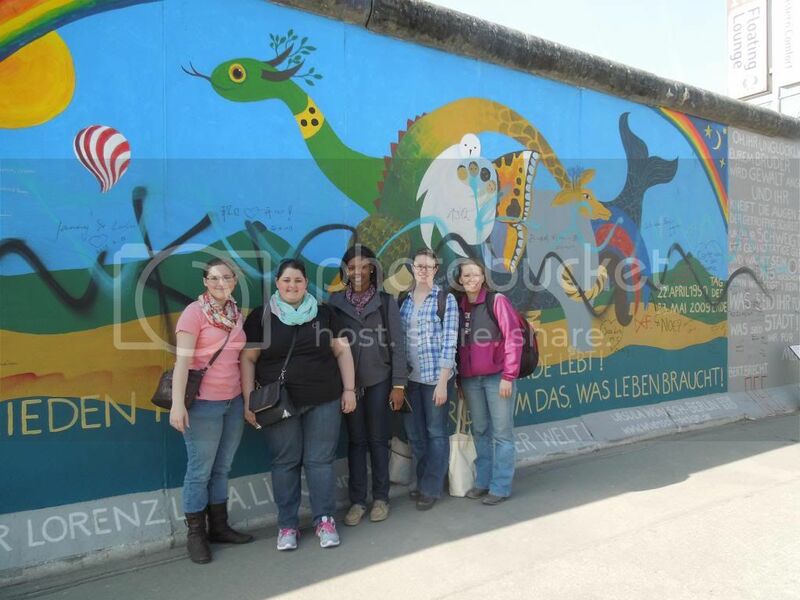 My journey to Germany has taught me several things as a future educator. The first is the ability to relate to my students because of a true understanding of where they come from and being more empathetic to their needs. Second is to be more open-minded while teaching the various subjects to a diversified classroom. Third, I now have a better understanding of how important visuals are in the classroom. In the methods courses, we are taught to have them and the more the better but until you are on the other side it does not really have a concrete meaning, but since I have experienced what it is like to do without them and not understand the language. I can assure everyone that I meet the realistic importance because there were days where I would have done anything to have a picture. 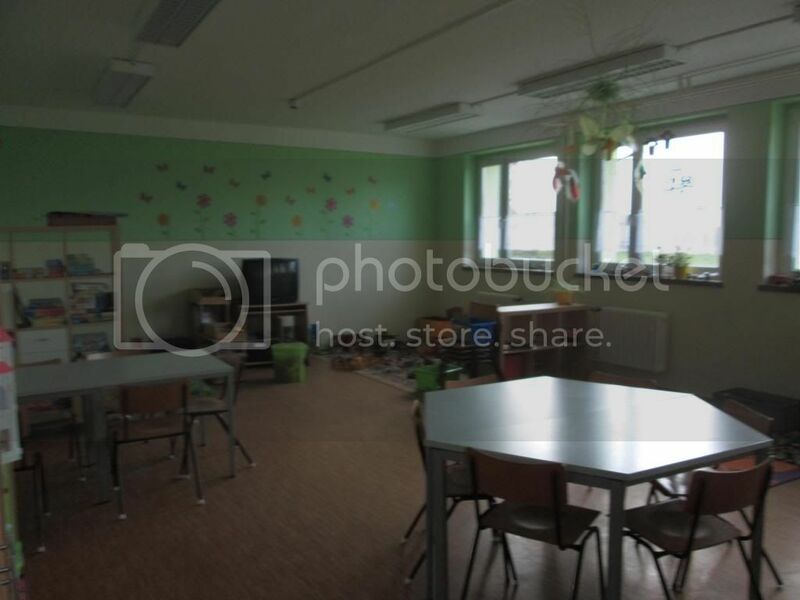 While it is true that I was unable to do more in the classrooms, I found myself understanding what I would do if I were the teacher in the room and a student teacher from another country came into my room and expected to teach my students. In addition, this trip made me realize something that I have often worried about since choosing education as my major. I was in the bilingual school and able to check student’s papers and help them during an English lesson, and I was ecstatic. I could help a child understand what they were learning which confirmed that teaching is where my heart and future lie. I am no longer worried that I chose the wrong profession and I am grateful that this trip provided me with that amount of certainty. “That’s it, we’re done!” (inside joke). There are three gates from the original city wall remain today. We were able to see one gate that was built in 1770, the Potsdam Brandenburg Gate, not to be confused with the Berlin Brandenburg Gate. 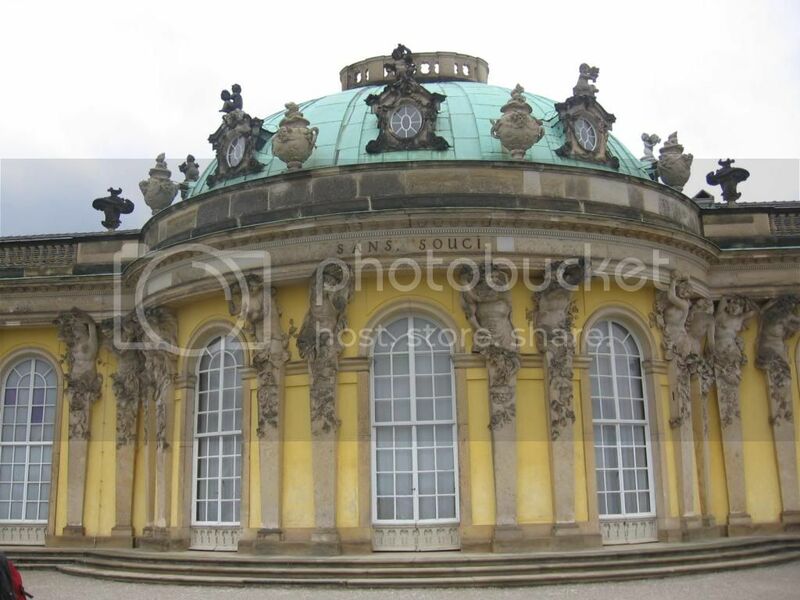 The main reason for our visit was Schloss Sanssouci is the former summer palace of Fredrick the Great, the King of Prussia. The palace was built with the purpose of relaxation instead of a power seat to conduct business. This concept is represented in its name, when translated “sans souci” is a French phrase, which means “without concerns”. 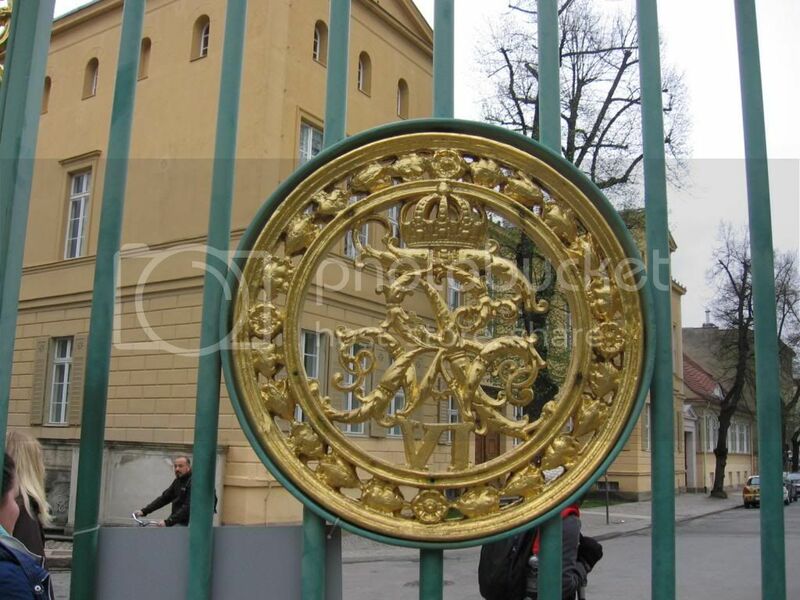 We walked from the Brandenburg Gate to the palace and were greeted with gates made of iron and gold overlay. We did not take the main entrance into the palace grounds, but instead went through a side garden and building. There we saw a church complete with long halls and a courtyard containing a prodomient sculpture of Jesus looking out into the gardens. As we continued our walk, we eventually arrived at the bottom of the terraced gardens. 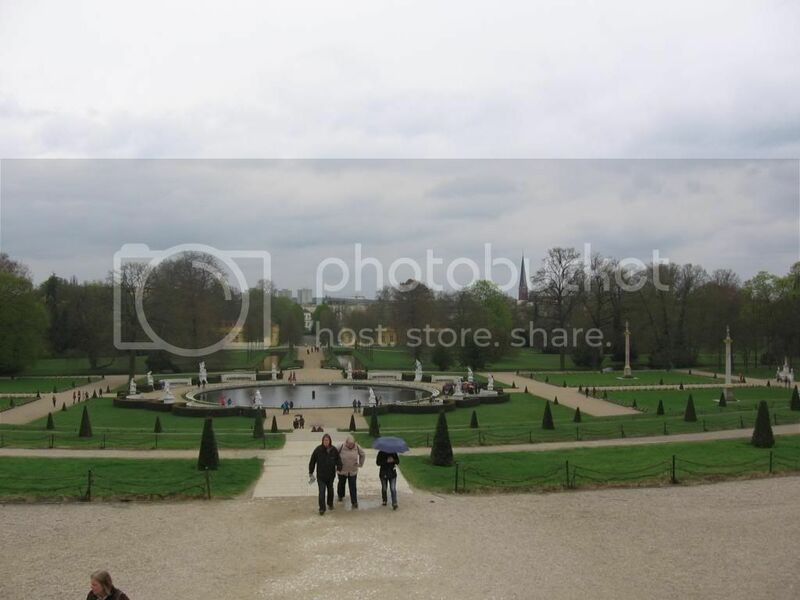 The gardens included had a long walk up to the actual palace via six flights of stairs (132 steps! ), several garden beds and marble statues surrounding a fountain in the center. The photo below is a view looking up the stairs. After making it to the top, we had a chance to look around at the building before going inside for the tour of the palace. Unfortunately, we were unable to take photos inside the building because it would have cost extra. The inside was amazing, and something that I will remember for a long time. However, the most memorable part of our day trip to Potsdam was the train ride home. We were taking the train back and knew that we would be on our own once again toward the end of our trip. Tanja left us between Berlin and Rathenow, and we made the rest of the journey alone. That is where our story becomes interesting. About two minutes before arriving in Rathenow, our train came to a complete stop and we stayed there for about three to five minutes before moving on to the train station. We knew that we had to get off our train and go to the opposite track to get on the train to Stendal. However, when we approached the train on the opposite track we were told repeatedly in German that we could not get on the train. As we looked at the train, we realized that there was it, and there were several people standing around not knowing what to do or where to go. This alarmed us because we had no phone or anyway of contacting someone to find out what was going on and therefore we had to be resourceful. We managed to find someone who spoke English and ask her if she knew what was going on but all she could tell us was that we could not get that train. We then found a train conductor who informed us that the train to Stendal would be arriving in two minutes. After getting on the train that arrived after the other train left, we were once again worried because if we could not find the train to take, we would be stranded in Rathenow. The train arrived and we decided to get on regardless of where it was going! As we boarded the train, we realized that we have picked up a little bit of the language or at least deciphering what someone was saying because a fellow passenger went to the front of the train. Next to where we were sitting, and asked the train workers if this was the train going to Stendal. Once she was done, we said, “Excuse me” to her, “Stendal?” and she informed us yes. We were finally relieved to know that we were on the correct train and heading home. The second stop was Magdeburg to see the campus and the cathedral. Tanja went with us on the train from Stendal to Magdeburg, and once in Magdeburg we met Tanja’s sister. They both guided us in the city and took us to the main college campus. 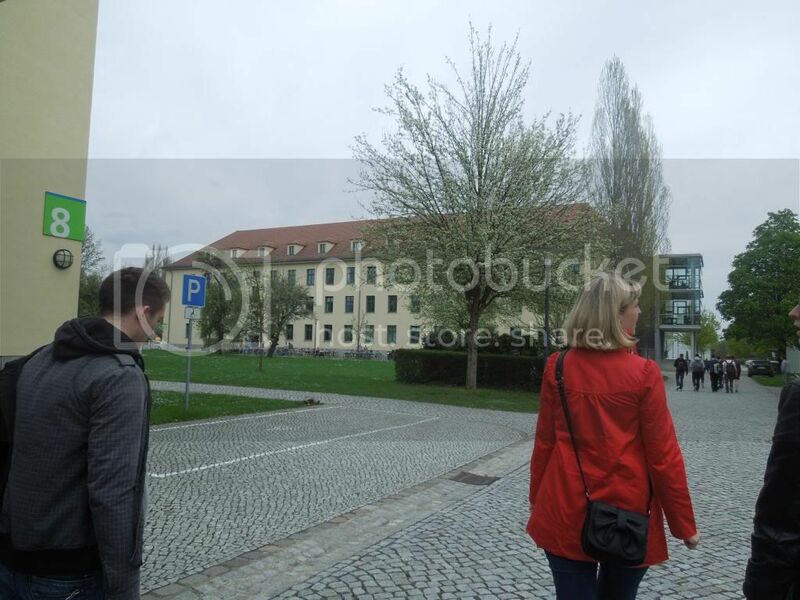 We walked around the campus, which is larger than the one in Stendal because the Stendal campus is a satellite school of the Hochshule of Magdeburg. The campus was about the same size or slightly bigger than Upstate’s campus. Some of the buildings were used by the Russians during the World War II the same as the Stendal campus. We left the campus, and took the tram back into town. We got off and made our way to the farmer’s market. We also saw the town hall protected by Roland and the church where the Protestant revolutionary, Martin Luther, preached. 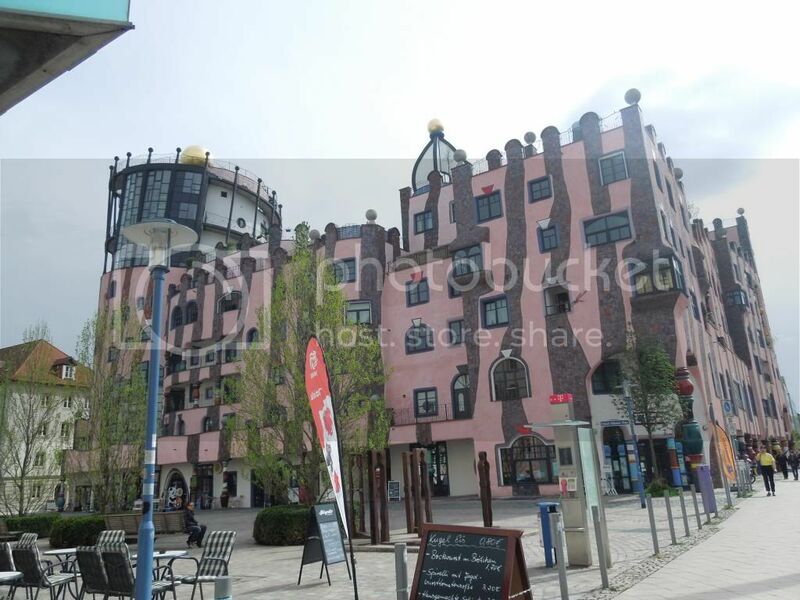 After leaving the farmer’s market, we took the tram to the cathedral but stopped to look at a very interesting building that is famous for its architecture called the Hundertwasserhaus. The architect, Friedrich Stowasser better known as Friedensreich Hundertwasser, was an Austrian artist. Hundertwasser despised straight lines and insisted on painting and building without using them. He built several buildings with this philosophy. The Green Citadel is the last building he was involved in and was completed in 2005 (five years after his death). 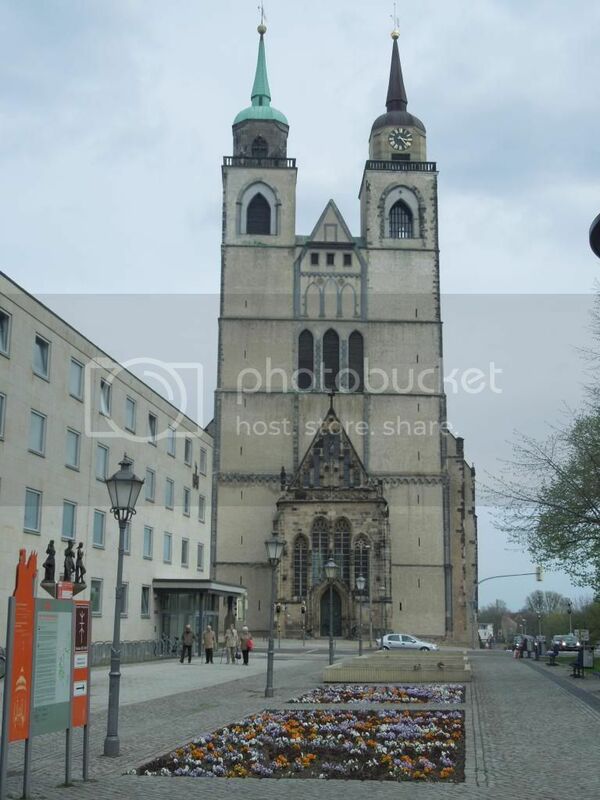 The Cathedral of Magdeburg, officially called Cathedral of Saints Catherine and Maurice, that we went to is over 700 years old. 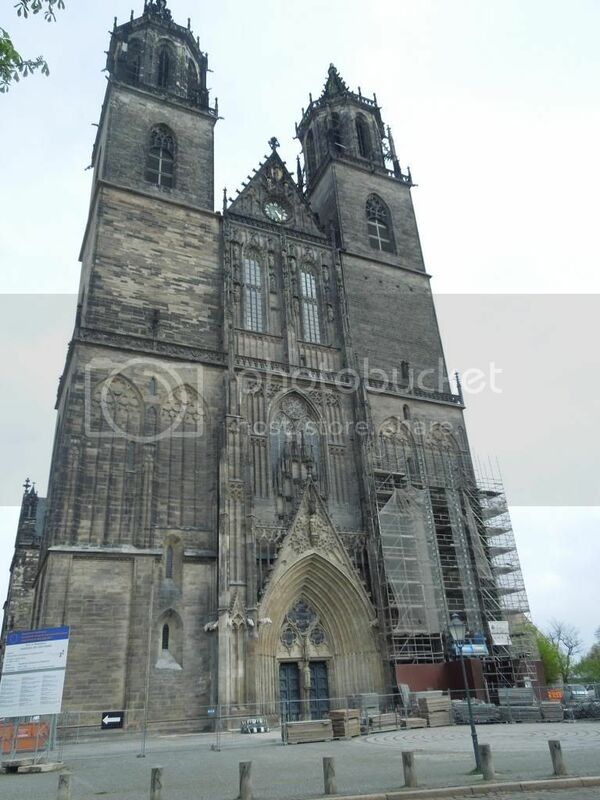 It is the oldest gothic cathedral in Germany. 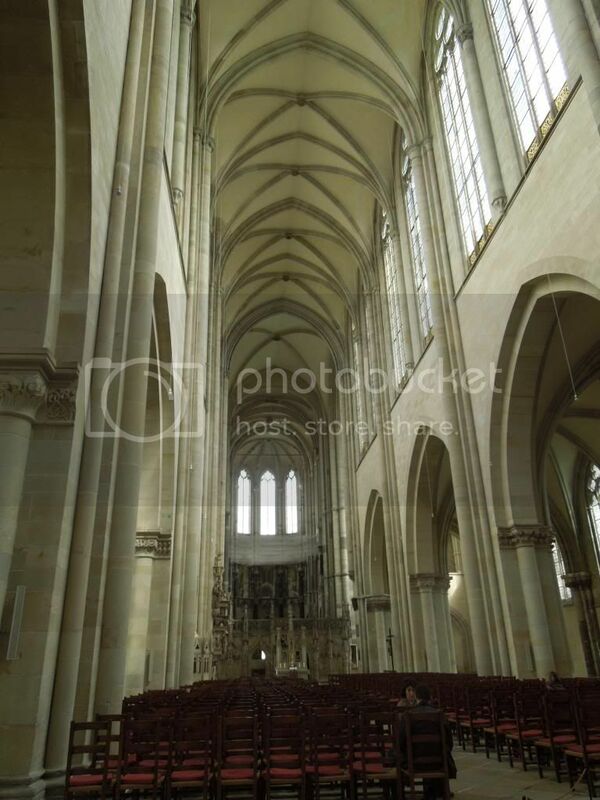 The current cathedral is built over the original church from 937 that was an abbey called St. Maurice. The entire original church was destroyed during the fire of 1207 except for the south cloister. The building was torn down with the exception of the south wall but was not finished until 1520. 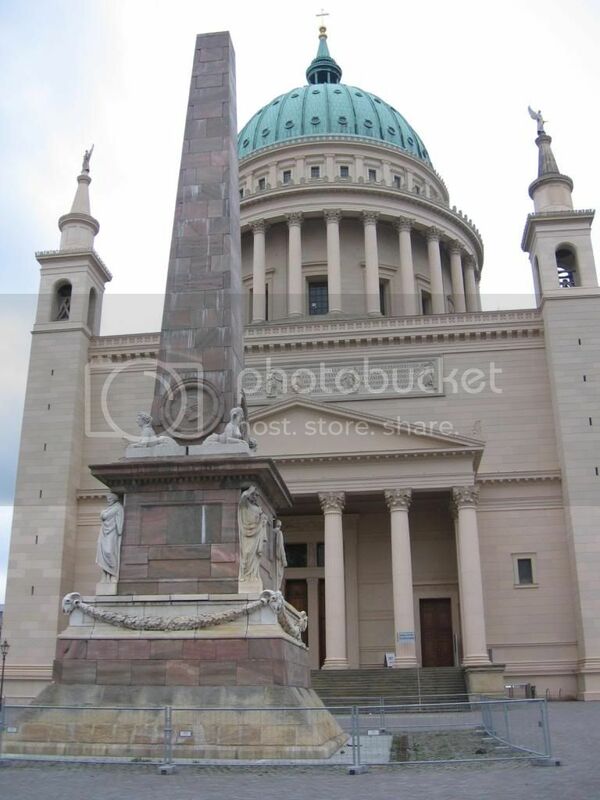 The cathedral changed from Catholic to Protestant and back again several times. 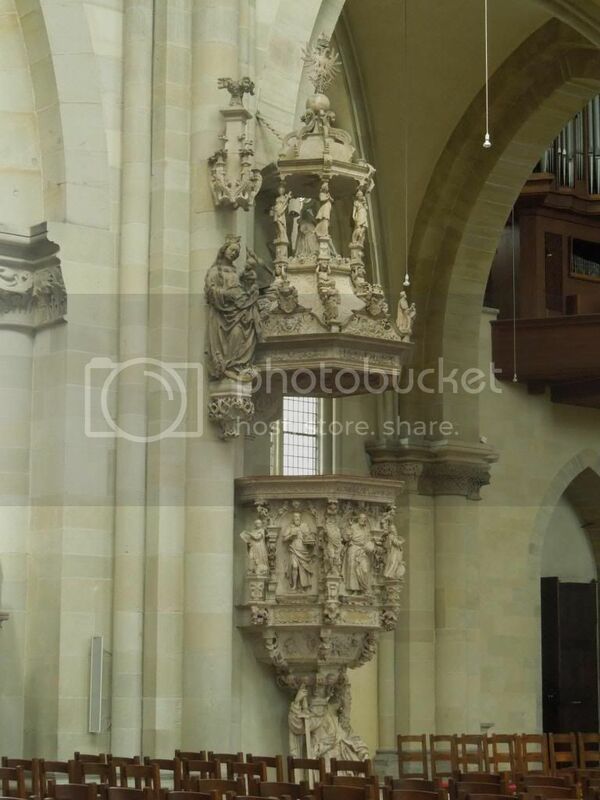 The cathedral survived the Thirty Years War and the bombings of World War II. The cathedral has extremely high ceilings and takes your breath away when looking at the intricate carvings of stone throughout the building. The church is constantly undergoing repair due to damaged it has sustained throughout the years. 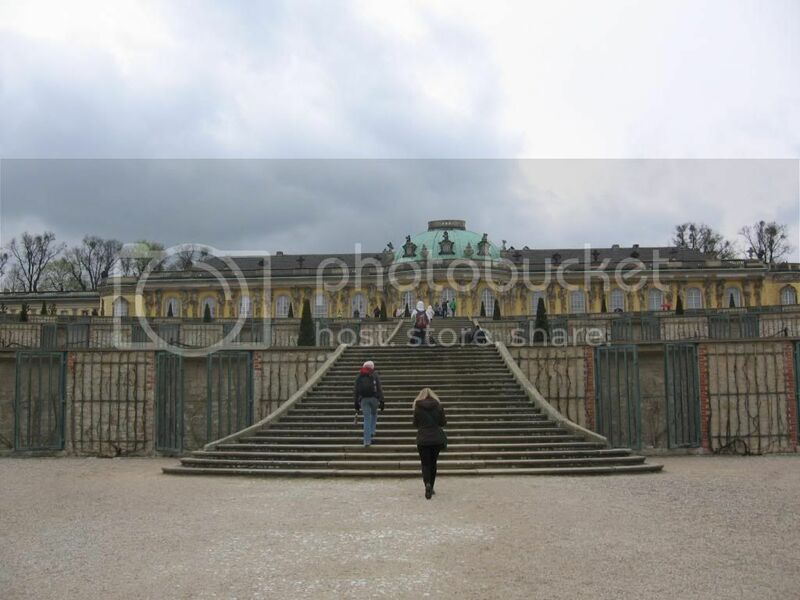 There is a courtyard surrounded by corridors that visitors can walk around because going onto the grass is forbidden in order to preserve the grounds. Along the walls around the courtyard, there are graves built into the walls. We were able to go below the church to view the original foundation and stones that were used to build the church, which were excavated in 2003. The church is still in use today with the largest service being Christmas. 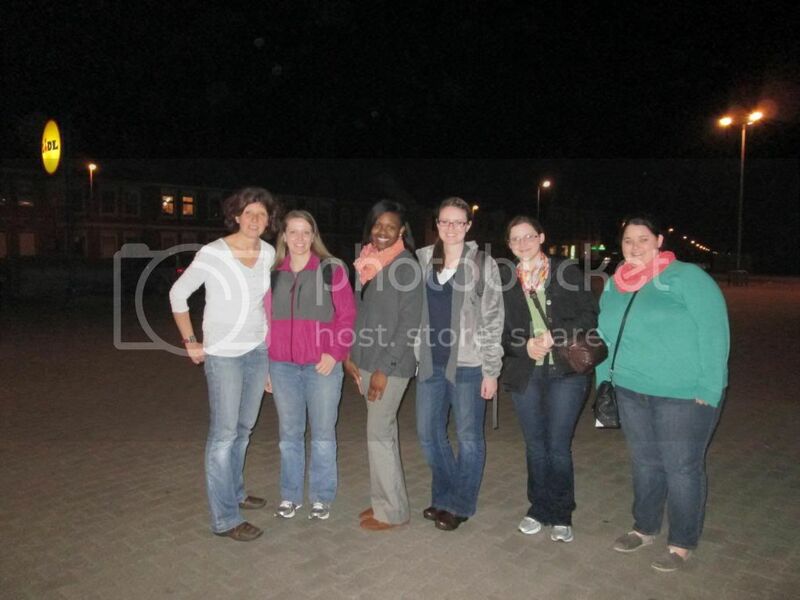 This weekend we got up at 5:30 to meet Sally at the train station by 6:30 for our trip to Hamburg on Saturday. 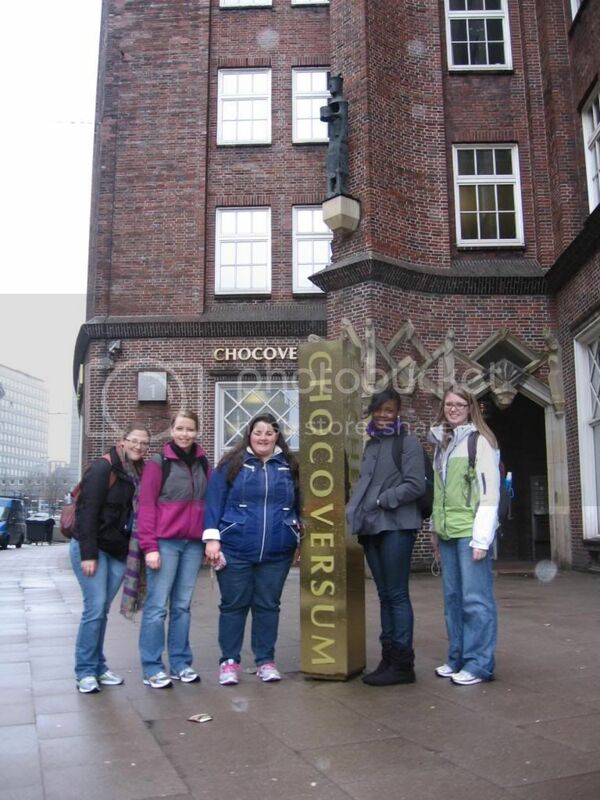 After taking two trains, we arrived in Hamburg where we planned to visit the Hachez Chocoversum (a combination between a chocolate factory and museum). On the way into Hamburg, we could see the huge harbor and the ships that were docking in the port. We arrived in Hamburg at 9:30, so we took our time walking to the Hachez Chocoversum because the museum did not open until 10:15. Taking the extra time to stop for the breakfast of champions: coffee and a pastry at one of the bakeries along the way. When the museum opened we were excited to learn about the process for making chocolate. They provided a tour guide booklet in English that we were mostly able to follow as we progressed through the Chocoversum. The tour started with discussing where the cocoa plant grows and what part of the plant is used to begin making chocolate. Our guide also started with the cocoa fruit, opening it to show us the white pods inside that each house a cocoa bean. Then, we were given the opportunity to taste a whole pod and chew the bean. We all tasted the seed, which was surrounded by a white fleshy pod that protects the actual seed. The best explanation for the taste was that it had the texture of an oyster (white pod), and the actual bean which was very hard and bitter. We went through every stage of the chocolate making process. Stopping only once to make our own chocolate bar using three different ingredients (coconut flakes, chocolate chips, hazelnut pieces, etc). At each stage, we had the opportunity to interact with the developing chocolate by either tasting, smelling, or touching. The tour was a very informational and interactive experience, and of course, sampling chocolate along the way was an added bonus. At the end of the tour, we received our chocolate bars and went through the gift shop before leaving to find lunch in Hamburg. We decided to have lunch at a restaurant called Prego, which was a nice Italian restaurant where we had pizza and salad. After lunch, we walked around Hamburg to look around and view the different shops and sights of the town. 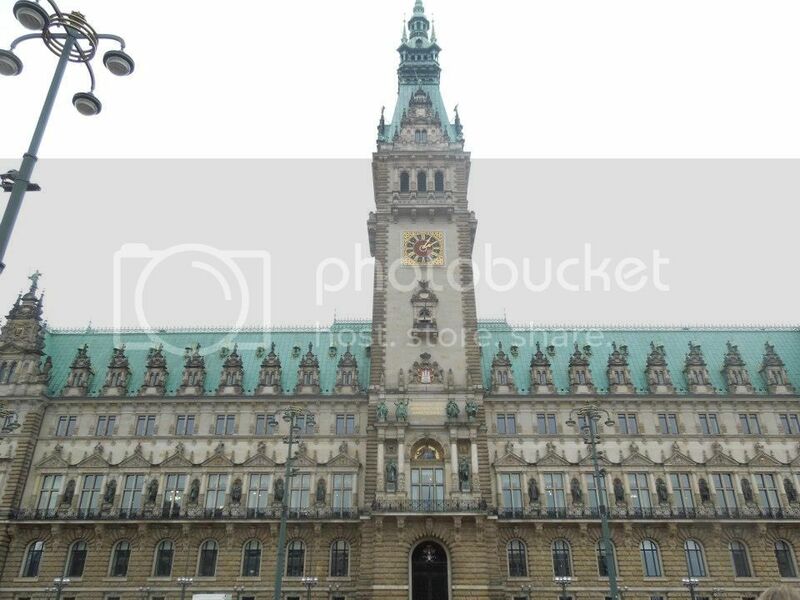 We made our way towards the town hall of Hamburg and the old market square with the oldest building in Hamburg. There we also found a memorial for those who lost their lives in WWI. After visiting the town hall, we made our way into the mall to look and shop around before making our way back to the train station to head home. On Sunday, we met Sally early in the morning to begin our trip to Brocken Mountain were we took three trains and a bus. 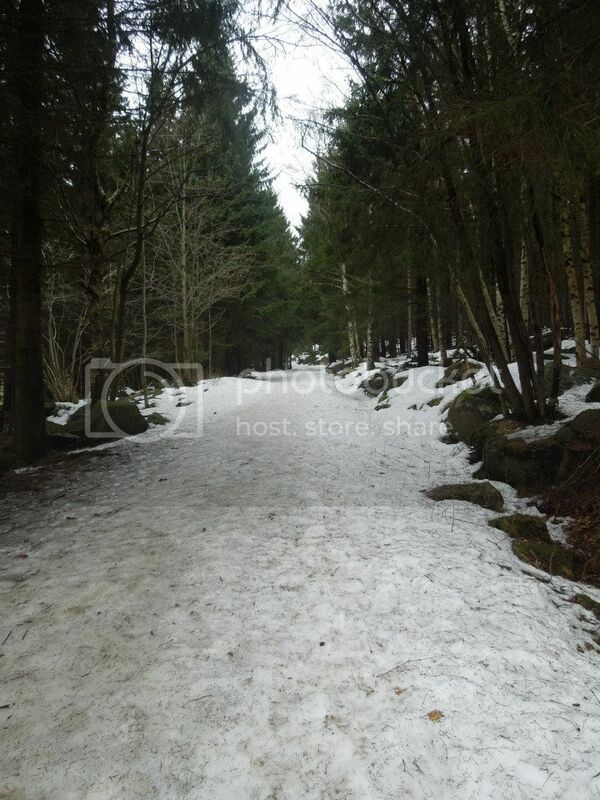 Brocken Mountain is the tallest mountain in the region, and is known for its amazing view. A view that we were unable to enjoy because the trail was covered in snow and ice. Since we were unable to make the hike up the mountain we had to make an alternative plan which was to go to the town below the mountain and look around. 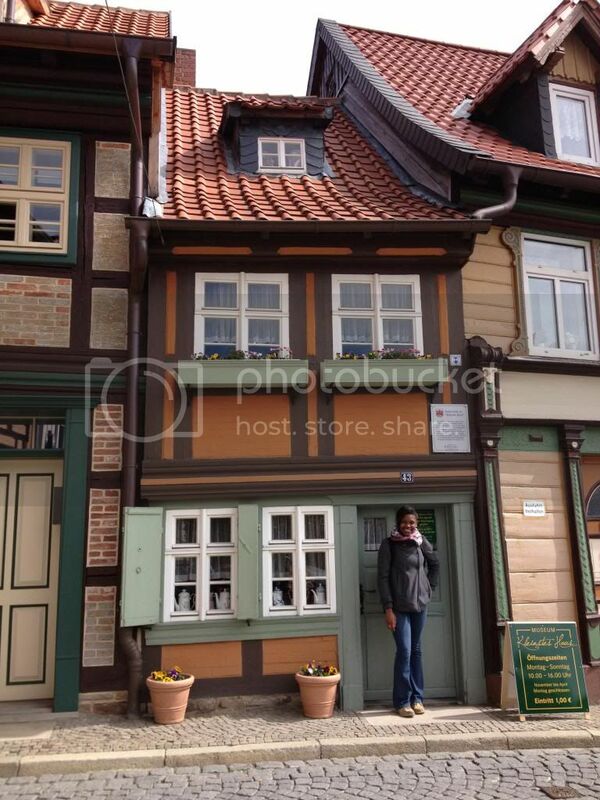 The town of Wernigerode is a small village town with winding streets and cute little shops. As we made our way around the town, we noticed the popularity of witches everywhere we went. 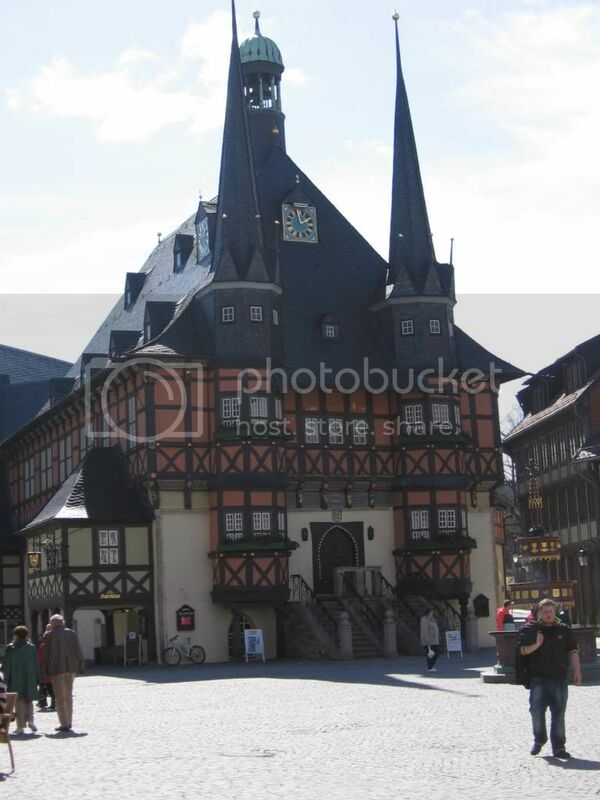 There is a famous castle in Wernigerode near Brocken Mountain and according to legend is the meeting place of witches so the town has capitalized on its fame. While in town, we found a great café to have lunch and ordered the best food we have enjoyed thus far on our trip.We also found the town hall in the middle of the town. Also, while exploring Tori and Sally discovered the smallest house and the last person that lived in the house 1963. After improvising on our trip, we made our way back to the train station to head home after a long day of sightseeing and to prepare for our visit to the Bilingual School. Our third week of school and activities were very interesting. We were not able to go to the Grudschule Am Stadtsee on Monday and Tuesday because we all became sick on Sunday night when we returned home from Berlin. I’m assuming from the various forms of transportation we took in Berlin (train, bus, and tram), we came in contact with someone who was sick. When we arrived at school on Wednesday the students and faculty were excited to see us and we were glad to be back because this week we switched classes and Silke, the headmaster, created schedules for us so that we could rotate to different grades and classes to see the differences between each. Jessica and I were placed in a third grade class on Wednesday. Our class is so sweet. They made ladybug flower cards for us and sang us a couple of English songs to welcome us to their class. During their Deutsch lesson, the teacher showed us a book that was purchased for a student with special needs. This student cannot read and the book helps break up the words for her so she is able to comprehend what she is reading. The student does not receive services from an in-school reading interventionist because they don’t have special services like that. Instead, her teacher takes her into a separate room and works with her one-on-one with the book. Wednesday evening we were invited to the Hochschule to attend the American Evening that they prepared for us next to the Menza. There were about 30 students who attended and we presented our PowerPoint that we created for the English class the week before so that the students could get to know us and where we came from. We had hot muffins and cola. One of the reporters from the English class came to check it out and take a photo for another article in the paper. All in all it was a great night! On Thursday, I was able to see the second, third and fourth grade English classes. It’s amazing to see all the different levels of English that the students are learning and how the teachers who teach English teach it so differently. It also amazes me how different the students behave for each teacher. I know in the United States that our students do the same thing whether they are with their homeroom teacher, art teacher or physical education teacher, but the teachers here rotate to different classes for just about every lesson. Our teachers do not do that. Teachers are moving in and out of the classrooms all day and students are left alone in the classroom between lessons for anywhere around 3-5 minutes waiting for their next teacher. I had a hard time with this because in our schools, students are not to be left alone in the classroom and here it is a normal thing. All five of us were able to participate in the 5th lesson of the day which was a 4th grade English lesson. We sat in two rows and had to interview and be interviewed with the student across from us. After about two minutes, Frau Thiemann would have us switch partners to do it all over again. 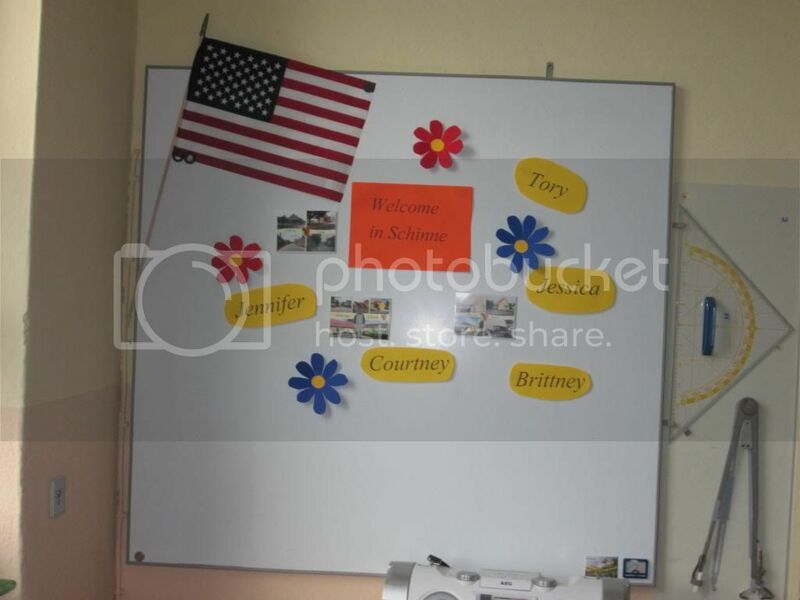 This was a great way to allow the students to work on their English as well as get to know us better. It was also a warm up for them because they had to present their Pet Report that they have been working on for three lessons. Each student had to say who they were, that they had a pet and what type of pet, their pets name/color/age, where their pet sleeps, what their pet can do, and anything else that they wanted to share with the class. This is the rubric in which they are graded on. The students had to come to the front of the class and were recorded as they presented. I can’t begin to imagine how nervous some students were to present in front of their classmates and us. Thursday evening we went to Sally’s flat where she and Tanja made dinner for us. They made Geschnetzeltes, which is a dish with chicken, vegetables, cream, and herbs. It was delicious! We are so thankful for Sally and Tanja and everything that they have done to set this amazing experience up for us and everything they have done for us since we’ve been here. 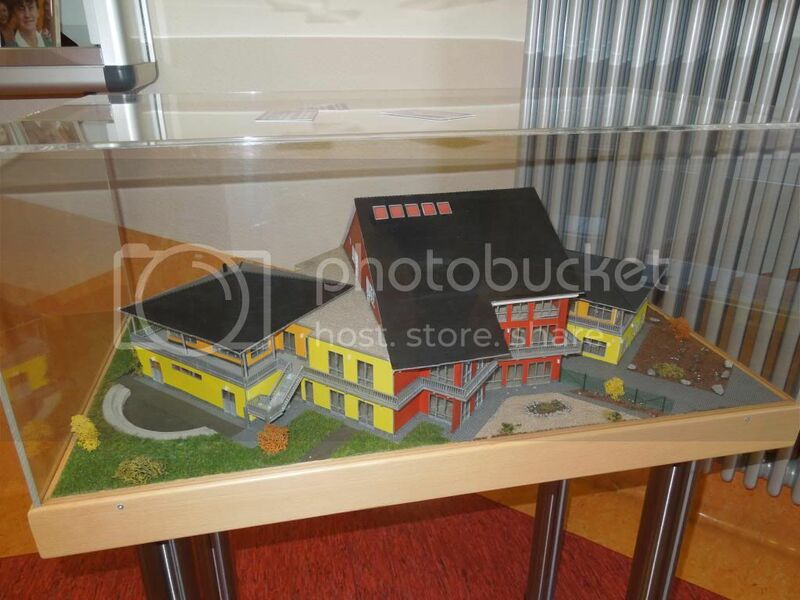 Friday we went to the Altmark Oase with grade 3b. This is the swim center in Stendal where the students go for swimming lessons as a group. The bus picked us up at school and brought us to the swim center where the students spent three periods there. Grade 3a had their swimming lessons in the first half of the school year and 3b has them the second half. 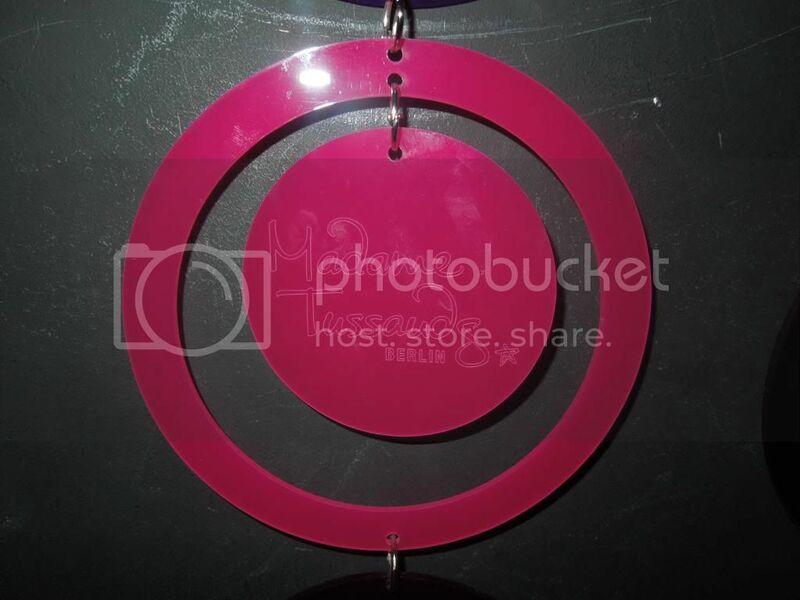 The center is beautiful. It has a six lane swimming pool with a diving board, an outdoor pool, a wave pool with white water channels, a waterfall, a slide that goes indoor and outdoor, and a splash pad for infants and toddlers. The students were divided into two lanes. One lane hosted the students who knew how to swim and only used a noodle to swim up and down the lane. The second lane hosted the students who needed assistance and used a noodle as well as waist swim belts. All students worked on their kicks and form. It was very interesting to see how the teachers taught the students how to swim because swimming is a state-mandated skill that all children learn to do in school. Each child begins learning how to swim in third grade and it is funded by the government. Another interesting fact is that all students learn how to ride a bike in school also. Each student begins at an early age when in school they take lessons. In fourth grade, the students have to bring their bikes to school and the police come to inspect them and make sure that the students know and understand the rules and laws of riding their bikes. They must have their helmet, a functioning bell, a working front and rear light and their brakes must work. I personally found the swimming lessons and bike information interesting since I have children in elementary school and we do not have anything like this in the United States. 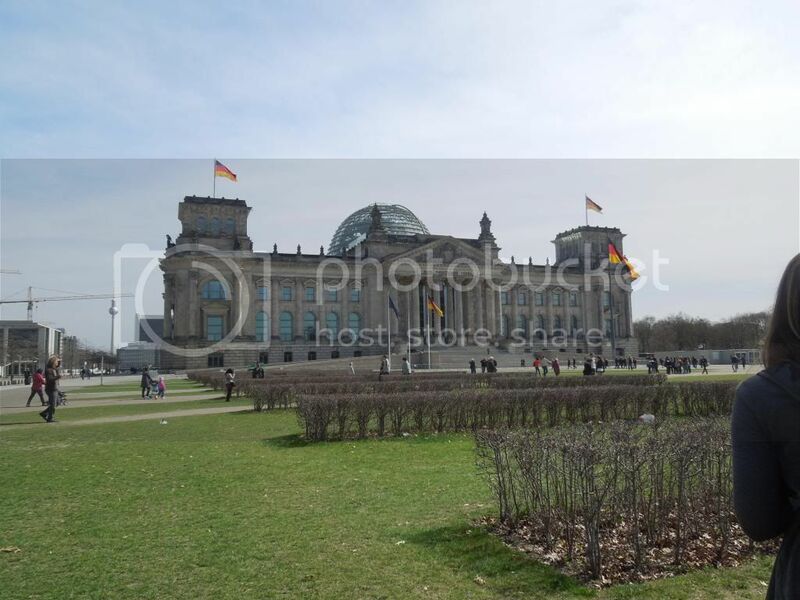 This past weekend we spent Saturday (April 20th) and Sunday (April 21st) in Berlin! We left around 10:00 Saturday morning to take the train into Berlin with Sally. We finally reached the Berlin Hauptbahnhof (the large train station) around noon. Some of us were talking about how much our perspective has changed since our first day here in Germany. 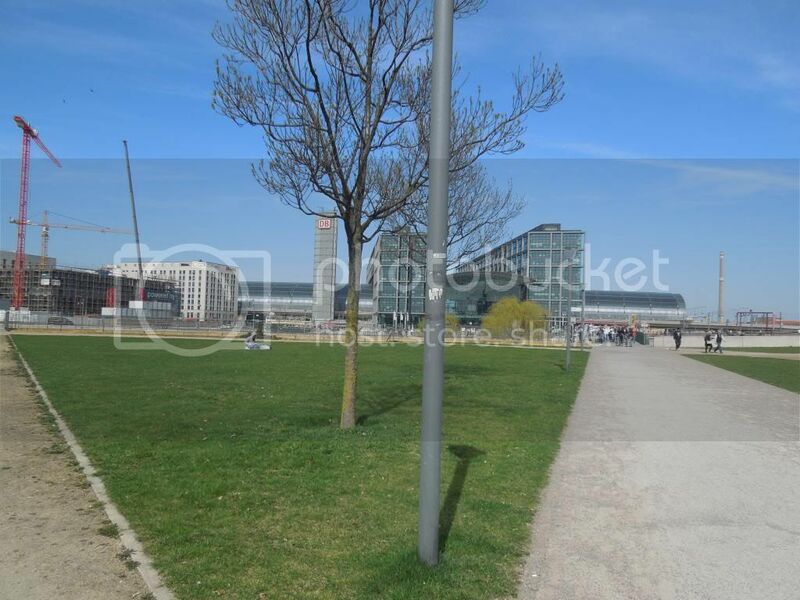 When we first arrived we had to travel to the Hauptbahnhof to get on our train to Stendal. We were all definitely overwhelmed, and scared. As we were walking through this past weekend we were much more accustomed to all the people, the schedules, and just the atmosphere around us. It’s great to see our different feelings of the culture around us, even after just three weeks. After buying our passes for all of our transportation over the weekend, we headed out to go look around. Our first stop was at the government building. We were amazed at the building and the intricate details incorporated into the structure. The building has so many pictures and figures carved into it; there is no way you can look at them all. Us in front of the building. 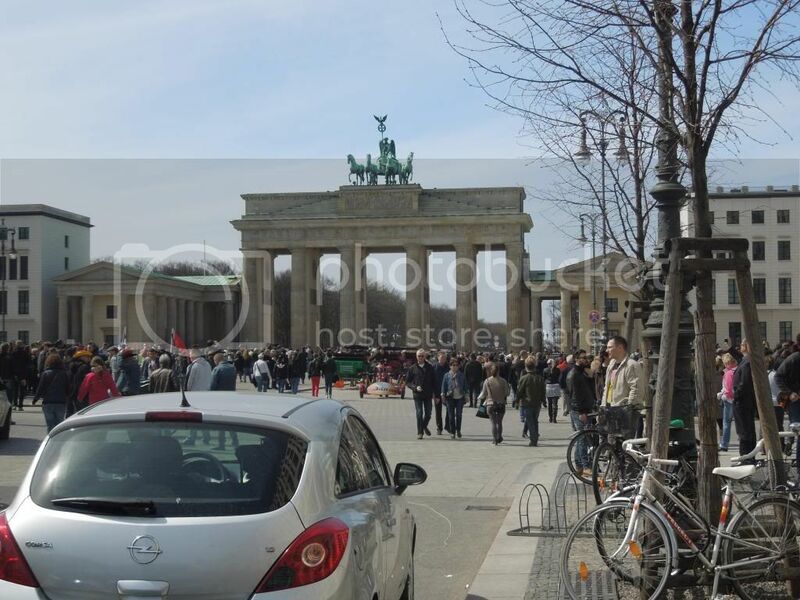 After a little bit more walking we were finally at the Brandenburger Tor (Brandenburg Gate). Tanja met up with us here, and we were off to try and get a few good pictures. There were tons of people there, but we managed to get a few pictures. We walked under the gate and it was such a surreal feeling. We knew that we would be in a very historic city when entering Berlin, but I do not think we were prepared for how much it would move us. We had just walked under a significant piece of history that many of our peers will never get to see in person. We were very close to Holocaust Memorial and headed towards it. Once we arrived we were very confused. It is a hilly area, with lots of concrete slabs that are different heights, in different areas. After looking up some history, we realized that this was the goal of the engineers and architects who designed the memorial. They wanted visitors to be confused and uneasy to give the feeling of how times felt during the Holocaust. 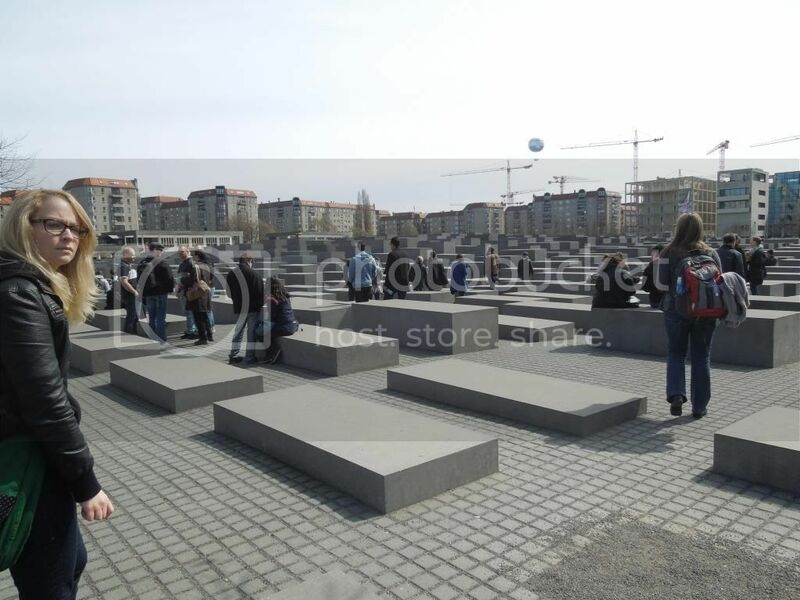 The confusing Holocaust Memorial in Berlin. Soon we were heading towards the Golden Lady (The Victory Tower). What we thought was a quick walk, ended up being about a two mile stretch. By the time we reach the tower we were all tired of walking so we stopped to take a few pictures of us with tower. Sally and Tanja explained to us that the lady is the symbol of victory; however where she is located now is not her original home. The tower used to be located in the Königsplatz, however in 1939 the Nazis relocated it to present location in the Groβer Stern. Us five at The Victory Tower. 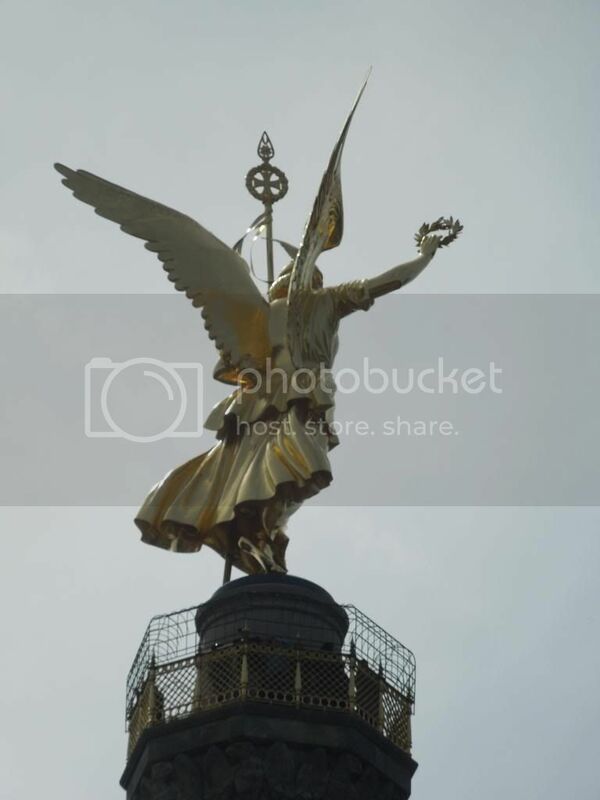 A close up of the Golden Lady. On the way to check into our hostel we passed by Bellevue, which is the home of Joachim Gauck, the President of Germany. 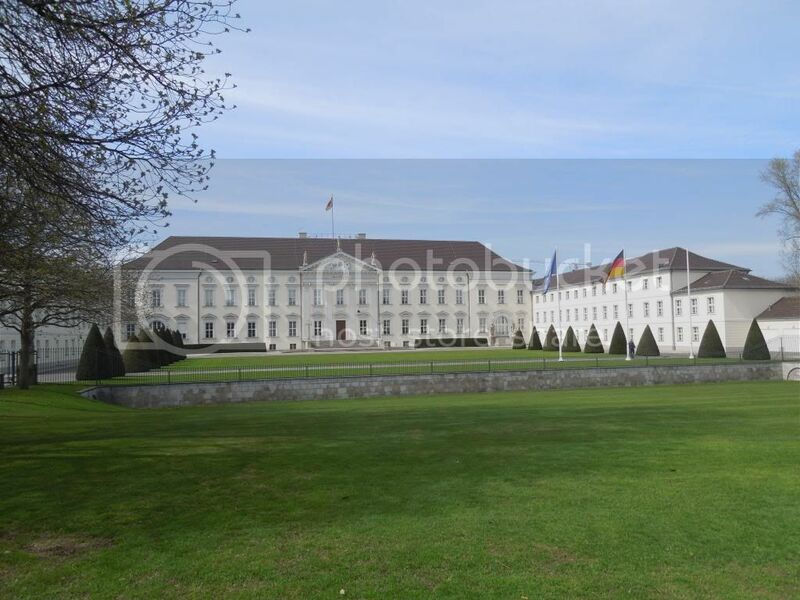 It has only been the place of residence for the President since 1994, and was actually constructed as a residence for Prince Augustus Ferdinand of Prussia. 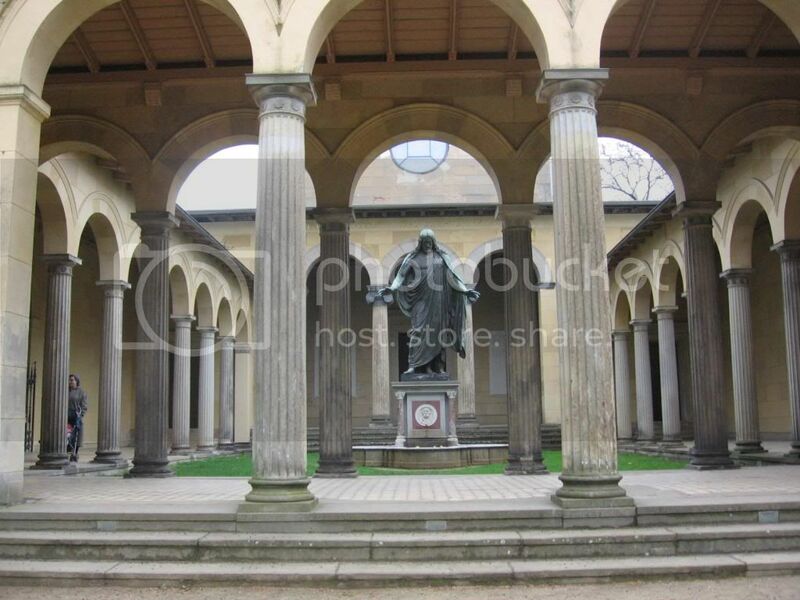 It also was the first neoclassical building in Germany. 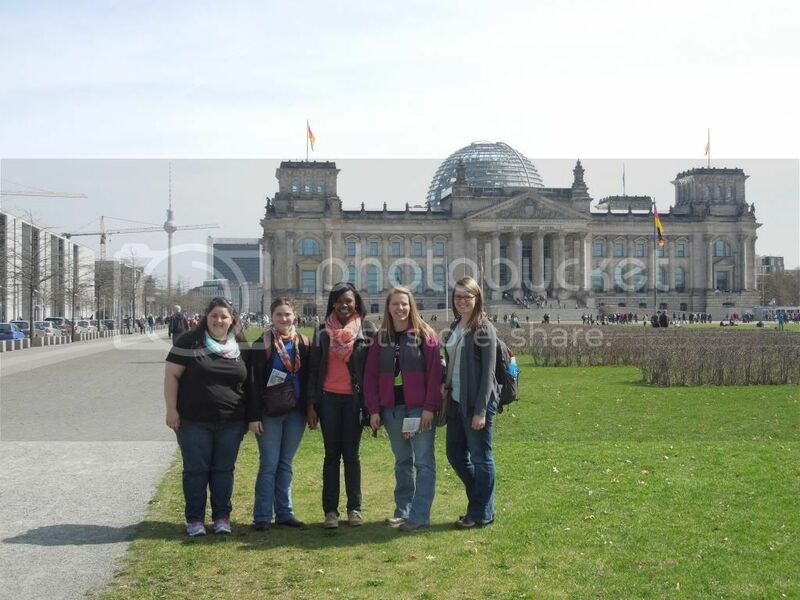 We headed to Alexanderplatz to check into our hostel and then headed to Potsdamerplatz. We experienced the subway here (which was very uneasy and shaky for most of us!) and did a little shopping in a close by shopping mall. We even had supper at an American diner! YAY for nachos and cheeseburgers! We all were getting tired so we headed back to the hostel to get some rest. We realized that our hostel was much like a dorm room with three bunk beds, one small bathroom, and a few storage bins! 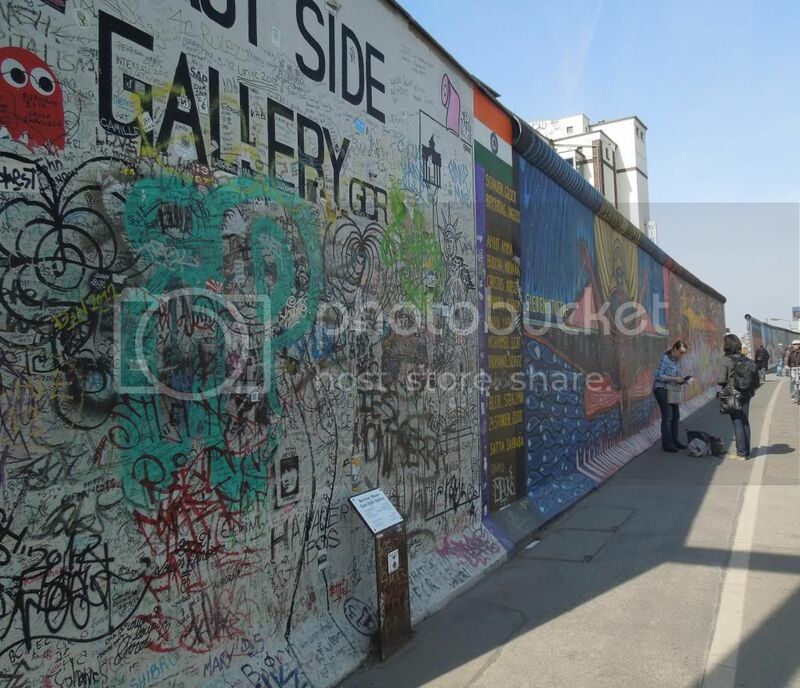 The first part of the East Side Gallery of the Berlin Wall. Us five at the Berlin Wall. 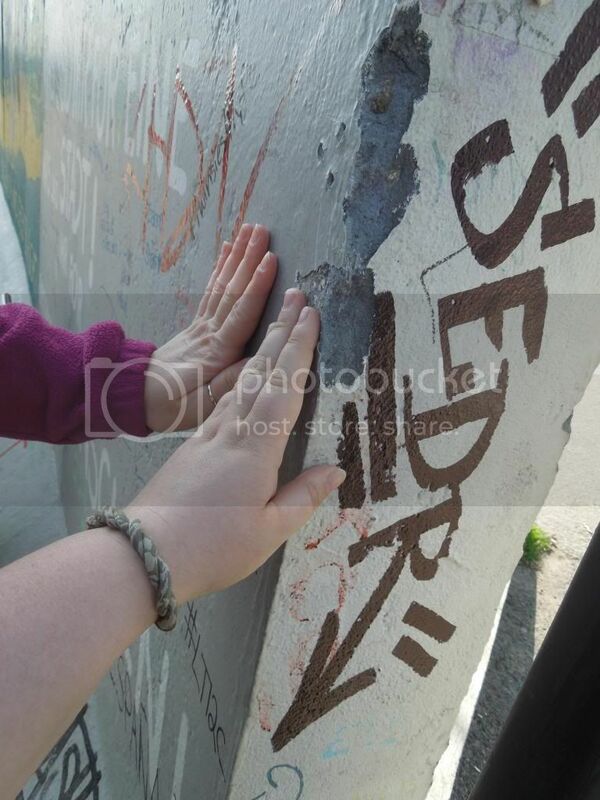 Jennifer and I touching the Berlin Wall. 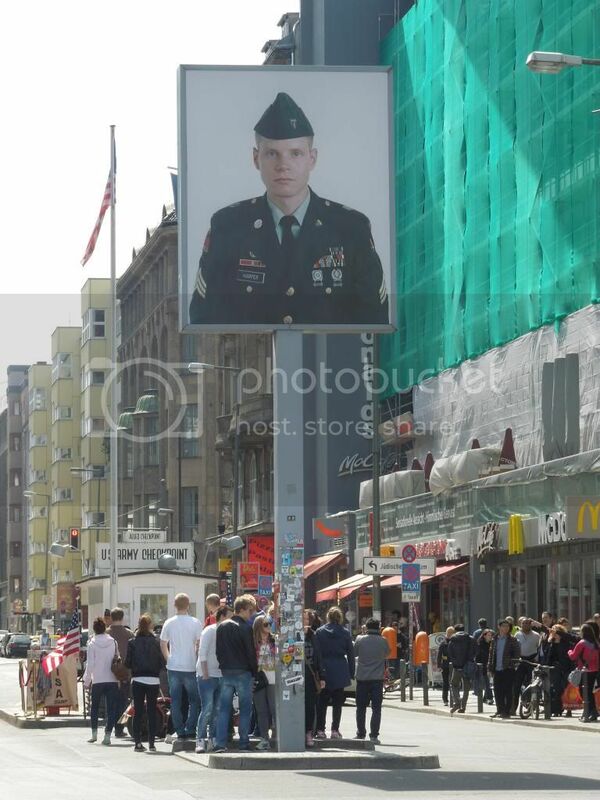 We headed to Checkpoint Charlie to take a look around. Checkpoint Charlie was the crossing point between East and West Berlin during the Cold War. We took a few pictures and headed to grab a bite to eat. 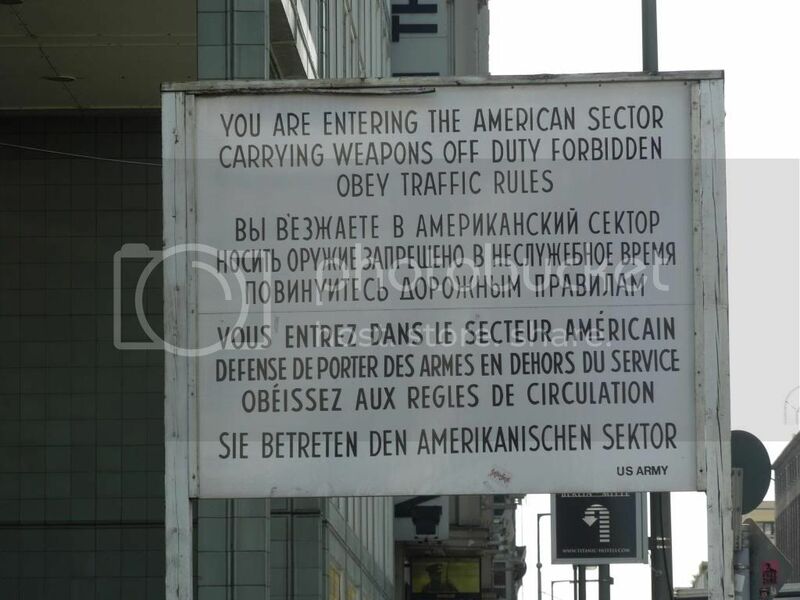 The sign we saw all around Berlin, and then realized it was used at Checkpoint Charlie. 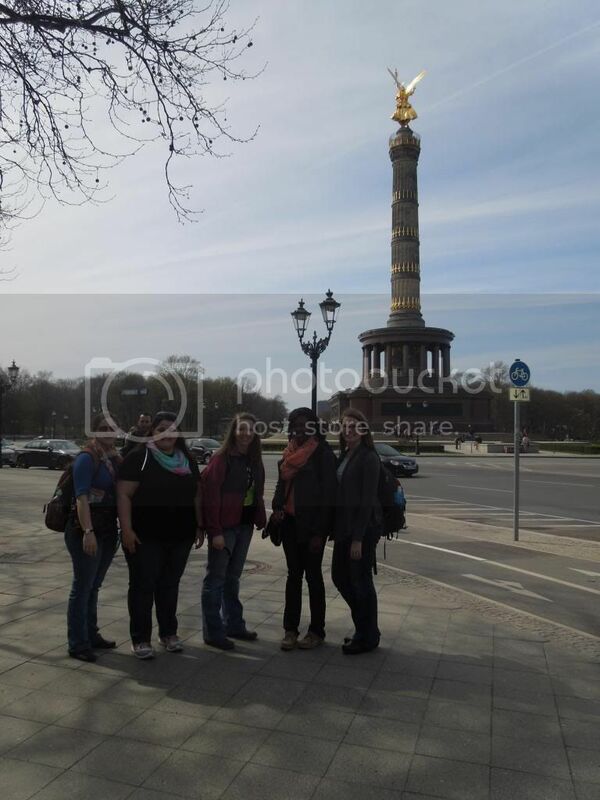 Lastly we headed for something fun that none of us had experienced to end our trip in Berlin. Madame Tussaud’s Wax Museum! None of us had ever been to a wax museum before and were kind of skeptical. It is very unnerving to the staring into the eyes of something that looks like a “person” and hard to not be afraid they are suddenly going to grab you and yell! However we had tons of fun, and even learned a bit more about Germany’s history! 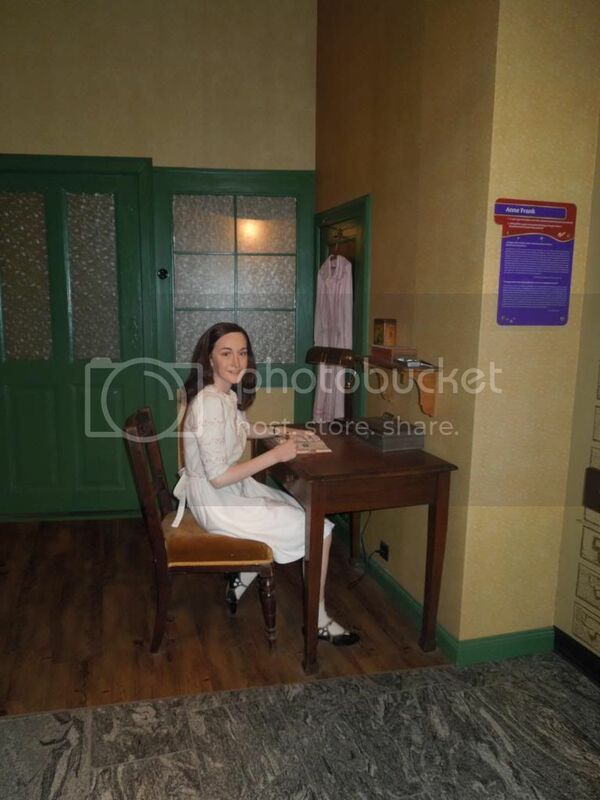 Anne Frank at the wax museum. We headed back to Stendal to relax after our long weekend. We were all overwhelmed from the amount of history we learned this weekend, but also elated that we were able to experience such a humbling place! Our second week of school was pretty interesting. After visiting the bi-lingual school on Monday, we went back to the Grundshule Am Stadtsee with varied perspectives on the differences between the two schools. An example would be that at the bi-lingual school, a lot more lessons are taught in English and students are more receptive to switching between two languages within a lesson. Another example would be that in the bi-lingual school, there is more cooperative learning and less direct instruction. Jessica and I were given the opportunity to show the difference in solving subtraction and addition problems as well as teach a mini English lesson. The difference in addition is that the students do not carry above the numbers but below the numbers. In subtraction, they use more mental math versus actually subtracting to solve the problem. They use the bottom number of the problem to find out how many they need to add to equal the top number, for example 9-2=7, how many do we add to 2 to make 9. In English, our cooperating teacher allotted us 20 minutes at the end of the lesson to speak some English with the students. We were told that they are learning about pets, clothing, and family members. We chose to focus our mini-lesson on clothing and colors (which they already know) by playing the game I SPY. This gave the teacher another resource to use while teaching about different topics in English and kept the students engaged while having fun. Of course we had to explain the game before we were able to play but the students quickly learned the concept and learned how to describe articles of clothing in English. Towards the end, we switched from articles of clothing to objects in the room as long as they described the objects in English they were able to use them. During a Deutsch lesson, the students were able to go outside and experience a blind simulation course. Parcours im Dunkeln came to the school and set up the simulation so that all the students in the school could experience what it would be like to be blind. They put on an eye mask and were given a walking stick in which they had to maneuver themselves through the course by using a sweeping motion to guide them. This simulation enabled the students to have a real world connection and have a better understanding of how blind people live their daily lives and the challenges they encounter every day. Overall, this week was a good week for us all! We are very comfortable speaking with the headmaster about any concerns or questions that we have and are happy that the teachers are accommodating and allowing us the opportunities to be more involved with the students. It is the end of our second week here in Stendal. Today (4-19) we were able to visit a school in a small village name Schinne. We woke up earlier than normal because we had to ride the bus to the village. It was weird riding the bus as it stopped at the different bus stops picking up the students to go to the school. The headmaster of the school was able to ride the bus with us to make sure that we got to the school without any problems. 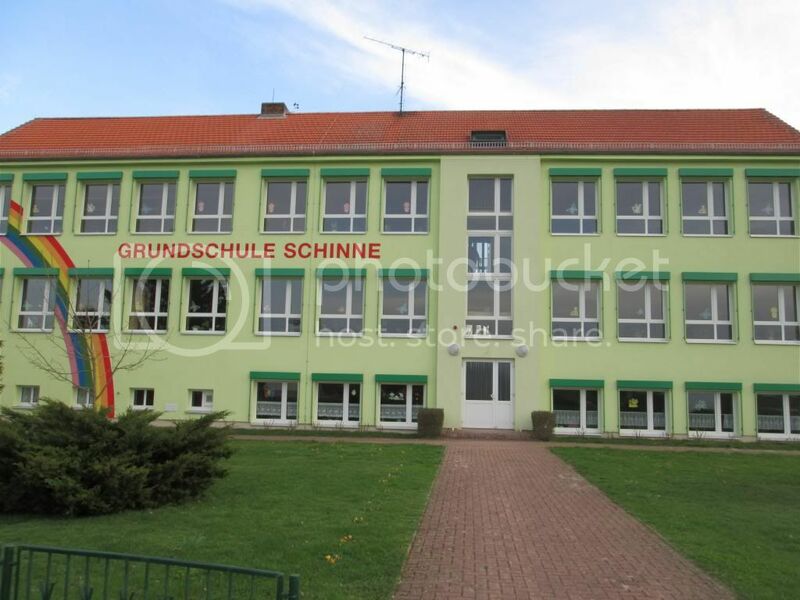 The school is very small and is half the size of the school here in Stendal. As we arrived to the school the students got off the bus and were given free time to play outside before school started. We went into the school and were given a tour of the school by the headmaster. As we toured the school we met a couple of the teachers and were excited to begin our day at Grundschule Schinne. Our first class was a 3rd grade class. We all sat in the front of the class and the students introduce themselves to us, in English. They told us many things, such as their favorite color, how may pets they owned, who their best friends were, and more. After the entire class had introduced themselves it was our turn to introduce ourselves. As I introduced myself I was able to show the students where we from on a big map of the United States. The students were excited and amazed to see how far we traveled to Germany. After we all introduced ourselves, we were given interviews by the students. The students stood in front of who they wanted to interview and began to ask questions. When I was interviewed, I was asked what my favorite food was, my favorite color, my age and a couple of other basic questions. The students did a good job of interviewing us in English. The students did a couple of songs in English for us and we played a game with them. It was a lot of fun. One of the students that have family in Texas brought us some gummy bears, and other German treats because they aren’t as good in the US as they are in Germany. It was really nice and I’ll admit the candy was really good. At the end of the lesson, three students played a couple of American songs on their Accordion instruments. Their teacher said they had been practicing a lot because they wanted to be able to play for us. As the day continued we went to visit other classrooms and were able to share about ourselves and the students were able to give us many more interviews. It was awesome seeing how much the children enjoyed having us in their school and enjoyed learning about us. I was amazed to hear them continuing to talk about it on the bus ride home. One of the girls that didn’t get a chance to interview us in the classroom came and sat beside us on the bus and began to ask us questions. It was really awesome to see the excitement she had in her while interviewing us. It was also awesome to see how much impact we have made by just being in their school for one day. It will definitely be a day that I will always remember and I’m sure they will remember as well. I enjoyed spending the day in the small village, it was a day well spent at the Grundschule Schinne! 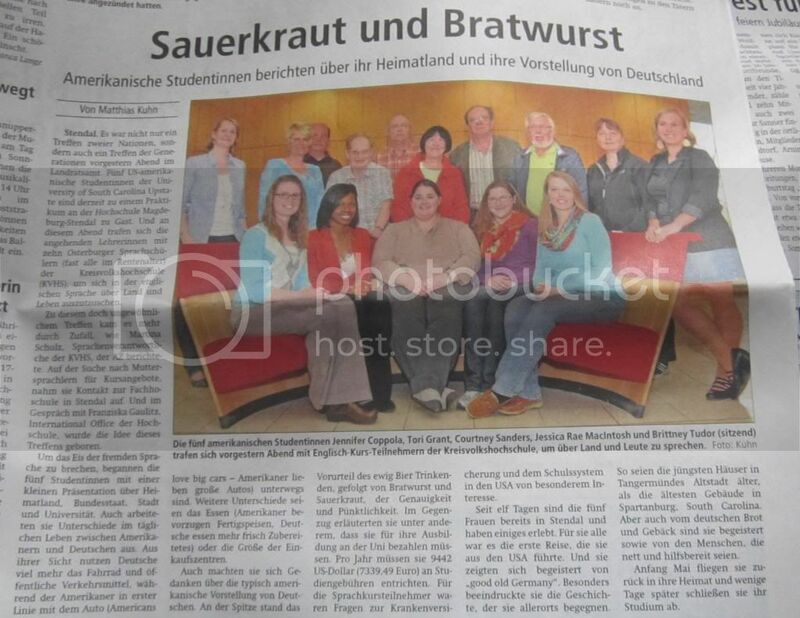 We were invited to the Institut für Elementare Musikerziehung to participate with the students in their music class. One of our “guides” Tonya brought us to the Institut and participated with us. 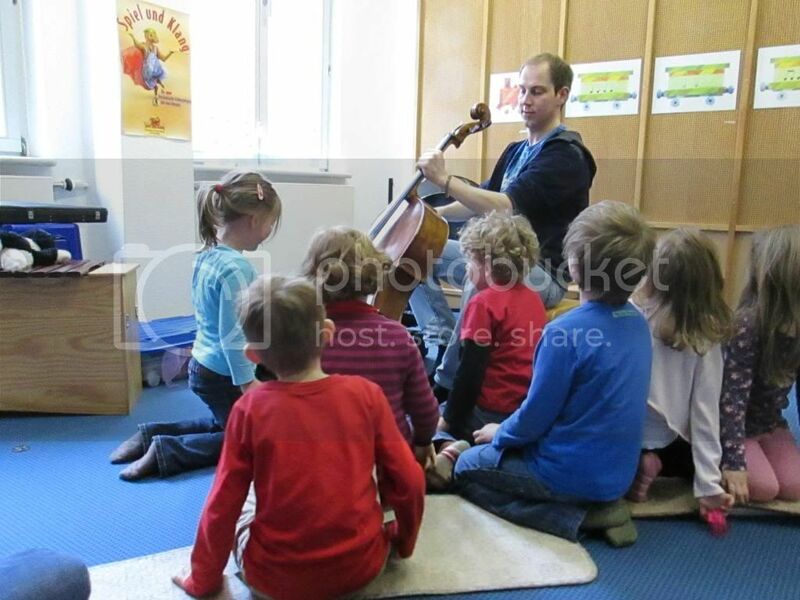 When we arrived, the music teacher, Sebastian was happy to see us and welcomed us into the classroom. Once inside, we had to take off our shoes and sit on rectangular pieces of carpet on the floor in a circle. 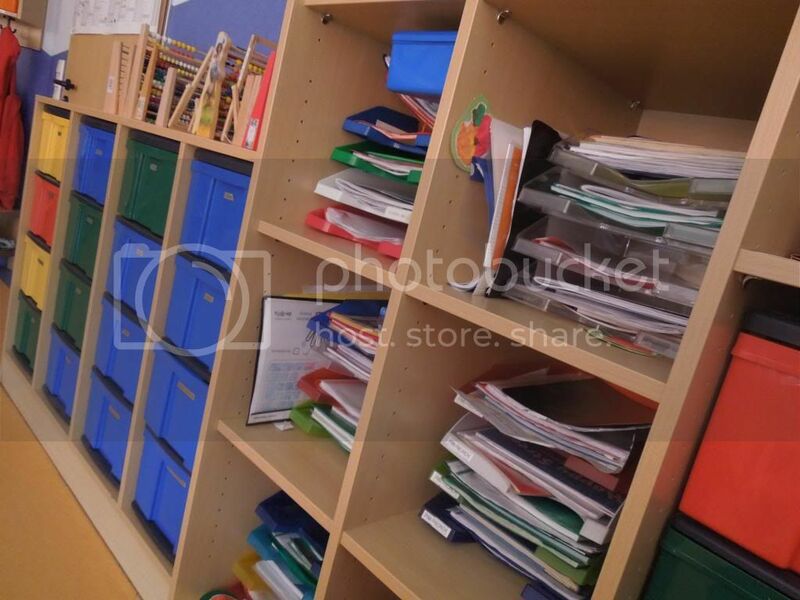 Each class lasts approximately one hour and we attended the four and five year old classes. Our first bunch was a group of girls and they were very shy but warmed up to us as the class went on. The second class was a co-ed wild bunch and I applaud Sebastian for being able to tend to all 10 rambunctious, eager to learn students and being patient with them. 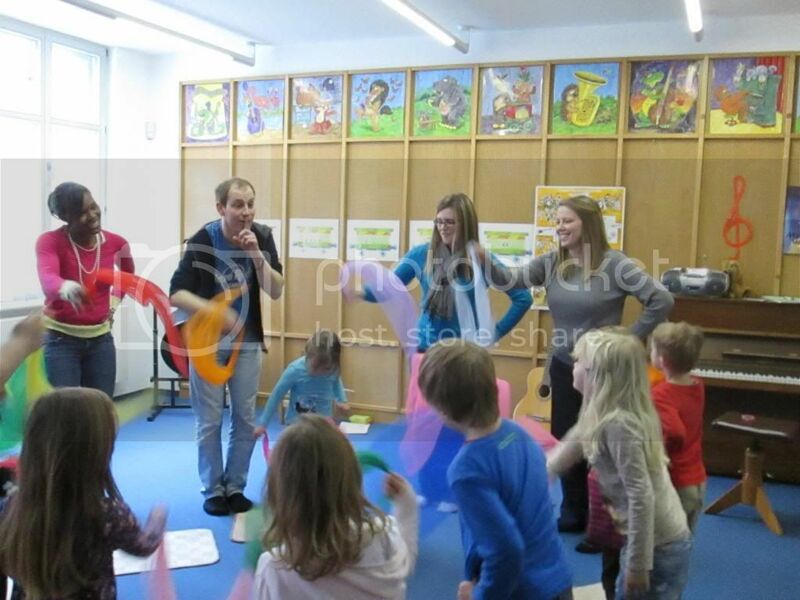 Both classes began by singing the Name Song (in German of course), in which we went around the circle and when the song stopped we had to say our name. This was a good ice breaker for the students and us as well since it was so repetitive we were able to quickly learn the words. As a group we learned hand gestures to Tchaikovsky’s “The Nutcracker Suite, Op 71a.” After we learned the hand gestures, we all had to choose a scarf and the fun began! Sebastian played the music and we were able to dance with our newly learned movements. Sebastian then brought out the musical note cards to review with the students. They are learning about the whole note, half note, quarter note, eighth note and their beats. The teacher and students have a “secret language” to help them remember the number of beats per note. They had hand movements and different sounds to teach pitch. After reviewing the notes, Sebastian brought a beautiful wooden xylophone to the center of the circle. The students were so excited to be able to play the xylophone! Each student was able to play. They sang a song and when it came to the chorus they played eight notes on the xylophone. Another song Sebastian played with the students was a song about a mouse that went up the stairs and when he was hungry he had to come back down to eat. Each word in the song corresponded with a note on the xylophone. Sebastian proceeded to ask the students to find the violin and cello in the room. When they did, he took the instruments out of the cases and showed the students. He asked questions about each instrument. For example, he asked them if the instrument was solid or hollow; what is the shape of the outline of the instrument; he told them that the body of it was called a corpse; he went over the different parts of the instrument and asked the students how many strings each instrument had. He had each student practice the form of holding a violin and then they were allowed to play the real thing. He also allowed them to play the cello. Afterwards, he had them touch the cello while he played the instrument so that they could feel the vibrations while it was being played. This week we had an opportunity to speak to a group of seniors. They were students who had been learning English for 1-2 years. There were approximately 10 students in the class. Some of the students had even done research on Spartanburg before we arrived. A few of the the students had notes and questions written down for us. The presentation was also open to the public so people other than the students could come if they wanted to. We prepared for the class by making a PowerPoint presentation. We told the class a little bit about ourselves and our lives. We told them about Spartanburg and the things to do there. We included 2 slides about Upstate and let them know about the degree programs, tuition cost, and student activities. The most important part of the presentation was the part in which we compared the daily lives of Americans vs. the daily lives of Germans. They were very interested in this topic. In Germany it is very common to ride bikes or take public transportation while we drive. There are also many small specialty shops here unlike at home when we frequent Target or Wal-Mart. We made sure to include a lot of pictures into the presentation so they could follow along easily. They had some great questions for us and we were able to talk about the stereotypes that Germans have of Americans (though the word stereotype is rude here so we said misconceptions). They said they thought of McDonalds, how polite we are, and how proud we are. They asked us about our healthcare system, our daily lives, and why we are in Stendal. There were also two reporters there from the local newspapers. They took photos and wrote articles that came out in the paper on Saturday. It was a great experience and we were happy to share about our culture. This is one of the articles in the paper about us. The wind was blowing really bad so the picture is not that great. The second time we were in the paper in one day! 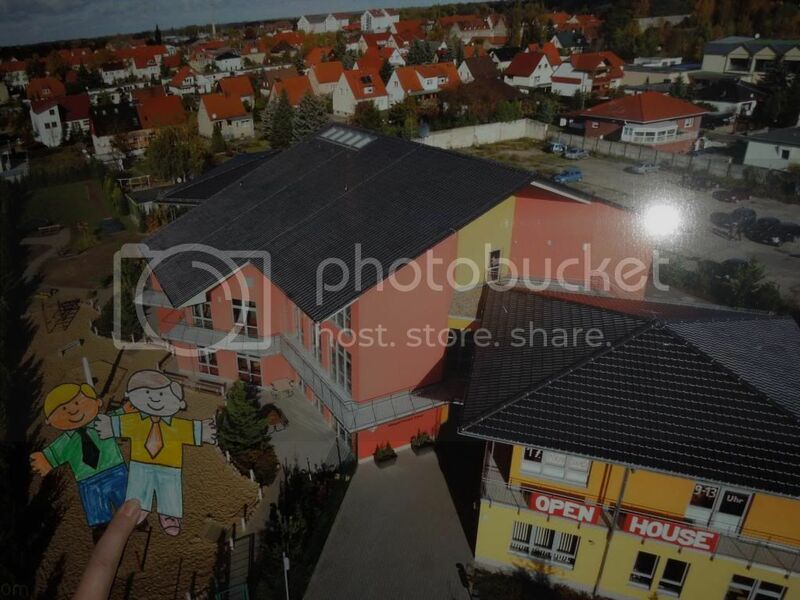 A picture of the schools, with two Flat Stanleys! 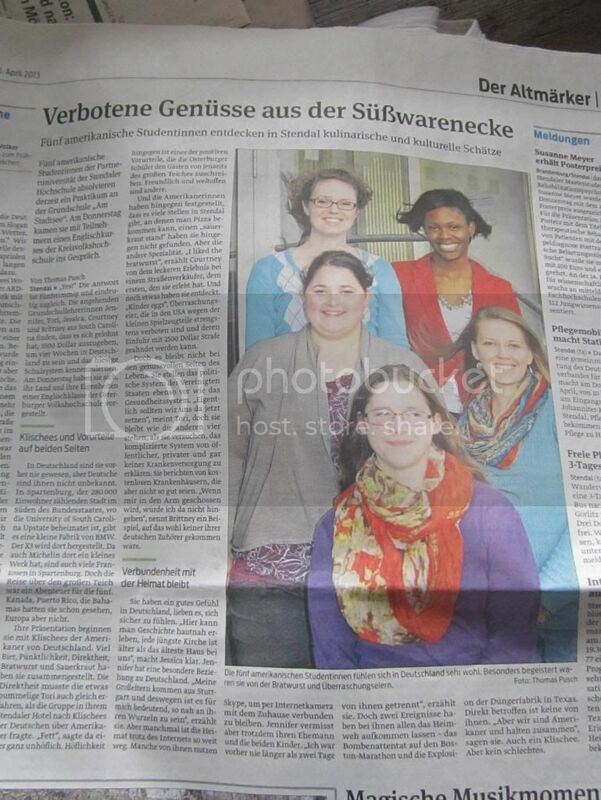 On Monday April 15th we have the opportunity to visit the bilingual school here in Stendal. The school is a private school that has two first, two second, two third, and two fourth grade classrooms. 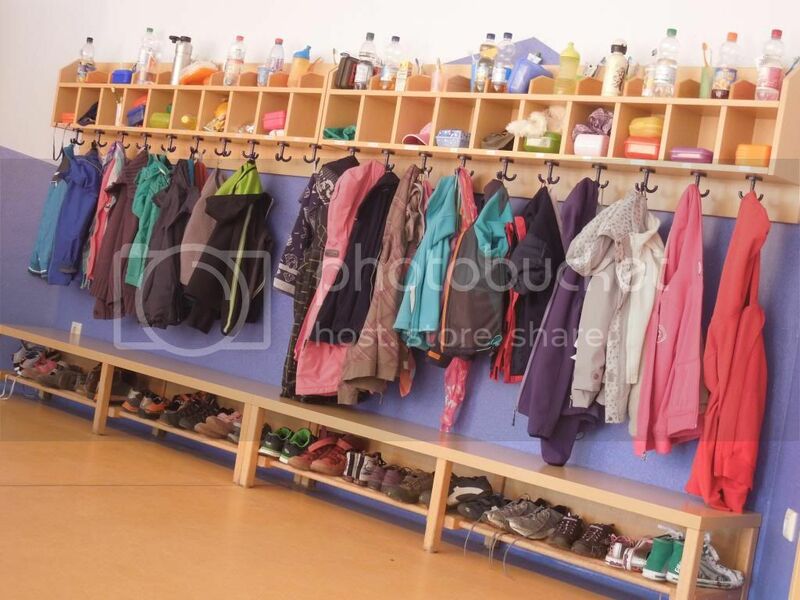 Since the school is a private school there is a fee for the students to attend, which is 180€ a month. 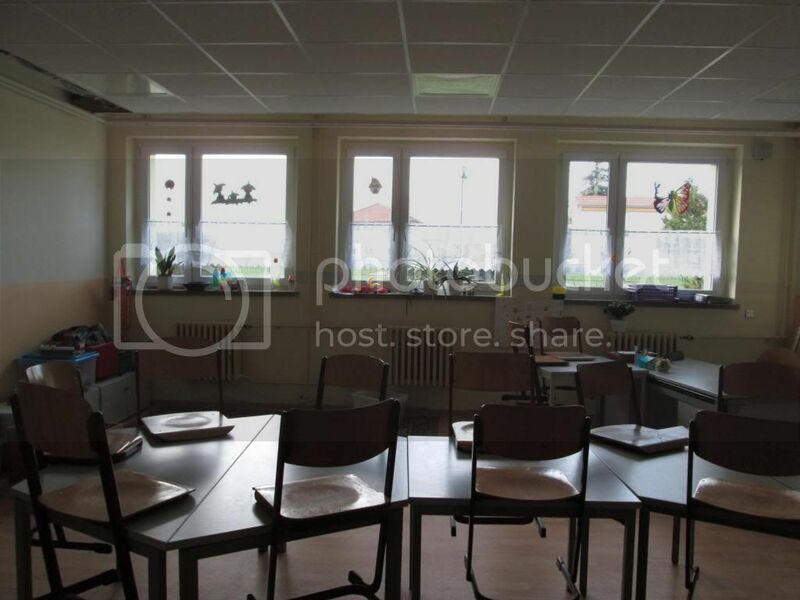 The classrooms each have twenty students in them. We started off the day by meeting Sally to walk to the school. The school is a little bit farther away from our flat then our other school, but not by too much! We were greeted by the Vice Principal Birgit who showed us the staff room. Soon Sally was off showing us the rest of the school. 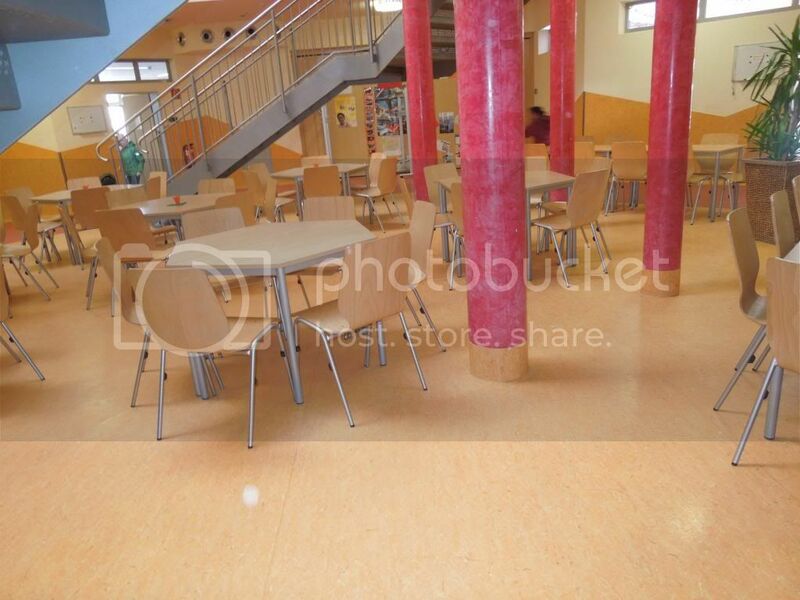 We all loved how open the school was, with the “cafeteria” just being in an open space in the middle of the school. There are three levels to the school – the bottom floor being the largest and the two upper floors housing several classrooms. On Monday mornings the school has their house meeting where the entire school (about 80 students and the teachers) meet in the gym to discuss the previous week. The school has a safety patrol which watches out at recess to make sure all students are on their best behavior, and a new safety patrol is appointed each week during this meeting. We were given our schedules and spilt off into pairs to observe. Jessica and I spent the first lesson of the morning in a “things” lesson for third graders – where the students can cover anything from science, to history, to life skills. The students were learning about fire safety. We immediately could see a different between our normal school and the bilingual school! 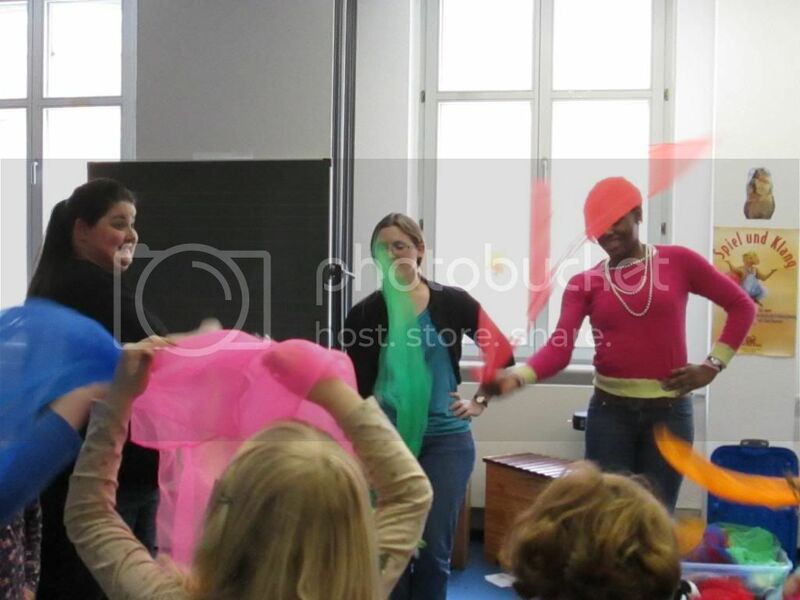 All instruction was given in English during this lesson, and we actually knew what was going on! The students were reciting a poem about what to do if your house was on fire from memory and doing very well at it. Soon it was time for breakfast break, and then we were off to a 2nd grade English lesson. The teacher for this lesson was Uta, who was very nice and welcoming to Jessica and I. Uta grew up in South Africa, but her parents are British so she has a very British accent! The students were looking at pictures and describing things they saw. The entire lesson was in English again, and to our surprise, most of the second graders were very comfortable with their English. They were able to make complete sentences, and even ask for help a few times. Jessica and I were allowed to walk around and help the students with their work. Jessica had a special connect with this group and was very excited to help since we student taught in a 2nd grade classroom. After the students had their morning recess break, we heading to a German lesson with the same 2nd grade class. The students were describing a tulip and spring. Soon the students were writing poems. This lesson was completely taught in German. It is still a shock to me how students can go from English to German in the blink of an eye. Next we were in a fourth grade English lesson. The students each introduced themselves to us and told us their names, about their families, and their hobbies. Jessica and I then introduced ourselves. The students were working on listening to descriptions in English and trying to find what is being described. They are working on this to prepare them for a test they have to take that is given by the government here. Soon it was time for lunch. Lunch breaks here are very different from ours in the states. The bilingual school takes an hour break where all the students are on the playground together and are called by grades to each lunch. While we think this would be crazy, there are actually only two teachers outside with the students during this time. They are very responsible, and the safety patrol that I talked about early also helps with behavior outside. At the end of the day the vice principal Birgit invited us to dinner at her house in Tangermünde the following evening. We all were very excited, but also nervous. This was the first time we all would be purchasing train tickets and taking the train all on our own. However, we made it safely to Tangermünde the following evening and had a wonderful dinner and great conversation with Birgit and her son! We have worked out where we can visit the bilingual school at least one more day towards the end of our trip and are very excited to return! Us with Birgit after dinner!